Daily Commentary – Friday, December 20, 2013 – Have you Heard of the Affluenza Defense? 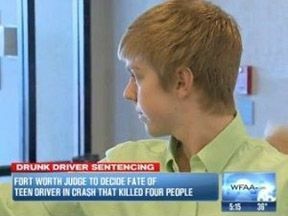 After driving drunk killing 4 and critically injuring 2, 16yr Old Ethan Crouch gets off with a suspension after his defense uses the Affluenza defense. WTF? JUSTICE ??? No jail time for teen for the intoxication vehicular manslaughter of four individuals because of “affluenza,” are you frigging kidding me? Ethan Couch was sentenced to 10 years’ probation by Judge Jean Boyd of the Fort Worth Juvenile Court for the vehicular manslaughter of Hollie and Shelby Boyles as the 16 year old was driving drunk with a blood alcohol content of over .20. WTF!!! Too rich to be held responsible? Huh, what kind of message does this send? Isn’t justice supposed to be blind with regards rich and poor? Couch’s defense was because his family was so rich that they have no raised him to learn right from wrong. Um, what!!! What am I missing here? So this punk gets a lenient sentence because he is a rich, spoiled, white kid. Does anyone think that the poor black kid who has absentee parents who did not teach them right from wrong and robs a store and kills someone isn’t going to prison? What’s next, povertitis? Honestly, I have never seen a case from start to finish that was so wrong in every sense. CRIME I: On June 15, 2013 Ethan Couch and some friends stole beer from a local Walmart store. CRIME II: Couch and his friends went to a party and drank the alcohol underage. CRIME IV: Intoxication manslaughter of 4 individuals: Brian Jennings, 43, Breanna Mitchell, 24, Shelby Boyles, 21, and her 52-year-old mother Hollie Boyles. To the families of the victims, Ethan Couch was a killer on the road, a drunken teenage driver who caused a crash that left four people dead. To the defense, the youth is himself a victim — of “affluenza,” according to one psychologist — the product of wealthy, privileged parents who never set limits for the boy. To a judge, who sentenced Couch to 10 years’ probation but no jail time, he’s a defendant in need of treatment. The decision disappointed prosecutors and stunned victims’ family members, who say they feel that Couch got off too easy. Prosecutors had asked for the maximum of 20 years behind bars. “Let’s face it. … There needs to be some justice here,” Eric Boyles, who lost his wife and daughter, told CNN’s “Anderson Cooper 360″ on Wednesday night. What kind of a precedent is this going to set? You have basically told America that there are two sets of laws, one for the rich folks who raise irresponsible kids and can blame their lack of judgement on money and the rest of us. This judge should be ashamed and removed from the bench, if possible. EXIT COMMENT: Seeing that the judge blamed this kids parents for his lack of upbringing because they were rich, I really hope the families who have lost loved one’s sue the pants off this Couch family in civil court and take them for ever dime they have!! !